APPROVED 29 JAN 1964 REVISED (E) FOR CHANGES SEE PAGES 1, 2 AND 3. MATERIAL : ALLOY STEEL IN ACCORDANCE WITH PROCUREMENT SPECIFICATION. 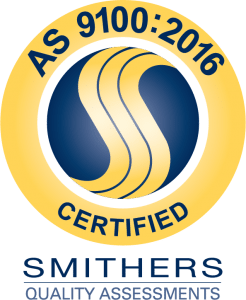 PROACTIVE COATING AND SURFACE TREATEMENT: CADMIUM PLATED IN ACCORDANCE WITH PROCUREMENT SPECIFICATION. THREADS: THE THREADS SHALLL BE IN ACCORDANCE WITH FED-STD-H28/2. 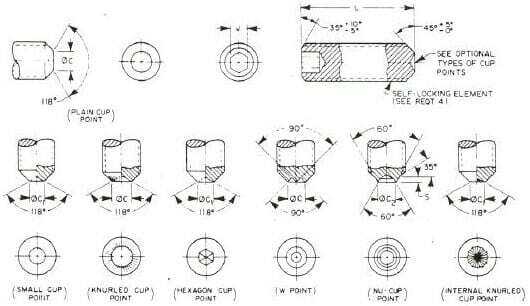 ACCEPTABILITY OF SCREW THREADS FOR SIZES .190 AND SMALLER SHALL BE IN ACCORDANCE WITH FED-STD-H28/20, SYSTEM 21. ACCEPTABILITY IF SCREW THREADS FOR SIZES .250 AND LARGER SHALL BE IN ACCORDANCE WITH FED-STD-H28/2,SYSTEM 22. SLEF LOACKING SCREWS SHALL BE INSPECTED PRIOR TO INSTALLATION OF LOACKING ELEMENT. The self-lockingh element shall be in accordance with procurement document. TOLERANCES: ANGLES +5&DEG;, UNLESS OTHERWISE SPECIFIED. PART NUMBER: THE PART NUMBER SHALL CONSIST OF THE BASIC MS NUMBER FOLLOWED BY A DASH NUMBER TAKEN FROM TABLE I.
MS51964_1 INDICATES- SETSCREW, HEXAGON SOCKET, CUP POINT, ALLOY STEEL, CADMIUM PLATED; 060-80 UNF-3A; LENGTH .125; PLAIN. ALL DIMENSTIONS ARE IN INCHES. 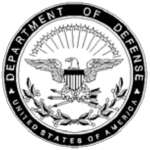 REFERENCED GOVERNMENT (OR NON-GOVERNMENT) DOCUMENTS OF THE ISSUE LIMITED IN THAT ISSUE OF THE DEPARTMENT OF DEFENSE INDEX OF SPECIFICATION AND STANDARDS (DOG1SS) SPECIFIED IN THE SPECIFICATION FROM A PART OF THIS STANDARD TO THE EXTENT SPECIFIED HEREIN. Screws covered by the dash numbers given in MS51018 and MS51020 are cancelled after 29 January 1964 and superseding by the screws covered on MS51964 having the same dash numbers. Cancelled Screw may be used until existing stocks are depleted. Use only MS51964 screws for new design. Screws covered by the dash numbers given in MS18063 in part are cancelled. Cancelled Screw may be used until existing stocks are depleted. Use only superseding screws for new design. Replacement shall be in accordance with Table II.